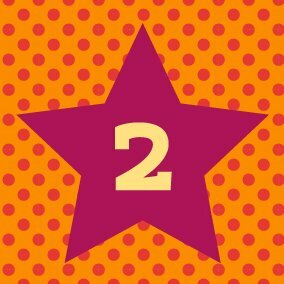 Counting by twos sounds so simple, doesn't it? This memorization exercise starts your child with the basic building blocks that will help her master memorizing basic multiplication problems. Learning can be fun if you incorporate techniques such as singing, playing silly games and completing fun worksheets. Videos and songs help to solidify the lesson in a different way than worksheets do for your child, so it is helpful if you offer several ways to learn the information presented. Check out the different activities below and let's get started! Printing out your practice sheet is easy. Just click a picture to open your printable worksheet in a new tab. Click the printer icon and you're set. Instructions are on each sheet, but I'll include more details for them below. The first printout is simple. There are 9 pictures of twins. Start counting by twos in the first box and write a 2 underneath the first set of twins. Then move on to 4, 6, 8, and so on. Once your child is done counting you can go back and count each twin individually to check your work. 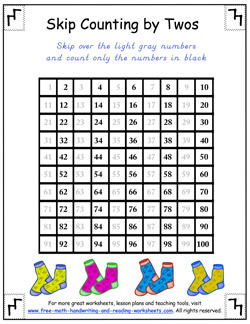 You could also use this sheet with the beginning multiplication lessons to show that 9 (sets) times 2 (twins in each set) equals 18. But, there's time for that later. Back to the twos. 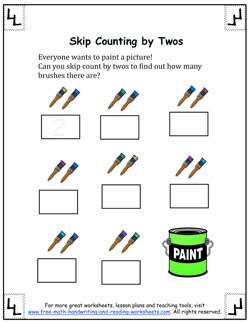 The next paper is very similar, it just uses a different object, in this case paintbrushes to show multiples of two. The third handout is a handy guide for learning how to count by twos. 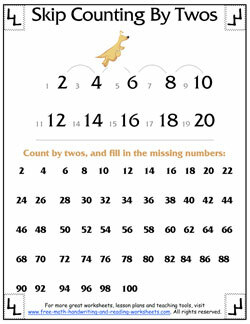 It clearly shows the twos in bold print, but this is also a good way to teach your child the difference between even and odd numbers. All of the odd numbers are missing. Write them down in the spaces between the even numbers. If you're following along in the skip counting unit be sure to introduce each skip counting level slowly, being sure the student has grasped the present level before moving on to the next. I recommend starting out counting by tens as children seem to grasp that concept the quickest. Frequent review is helpful as well. Whatever you do, make sure your child enjoys it. Keeping it fun helps lighten up the learning environment and takes stress away from your child. Reducing your child's anxiety about getting simple counting exercises down will help open them up to learning multiplication, which is the next natural step from skip counting.